Spring has reluctantly arrived over here in the UK. An increase in the temperature is most welcome, even if it is only marginal, due to my location! However, similar to all of my fellow patients around the world, to make it out of winter without any body crisis by way of flare ups or the like, is quite frankly, a miracle. Even with continual house arrest, commencing in autumn, I have still not managed to escape the wrath of the cold winter months, unscathed. Winter really is, my nemesis season. This winter, 2017 – 2018, I have had numerous health challenges in addition to my scleroderma and Raynaud’s ‘carte blanche’ symptoms. Even after living with this diagnosis for 21 years, it still continues to amaze me with the surprises which it can ‘present’, and not in a good way! So far this year, my Pandora’s Box of symptoms have included Shingles, my Bowen’s disease skin flare / follow up. As well as, dental inflammation and more recently, a very nasty digital ulcer on my right index finger (chief typing finger). Sadly, as I could no longer cope with the pain, I had to take a week’s course of flucloxacillin, which has triggered my GERD symptoms. However, when I went to see the wonderful, global scleroderma trailblazer, Prof Chris Denton, for my routine appointment recently, he was and remains, delighted with my return to well being progress. My consultation appointment is the only time, when I am content to be described as ‘stable’ or ‘normal’, and, voiced by a person whose opinion I respect and value …haha. I feel truly blessed to be under the care of such a scleroderma pioneer medical expert. 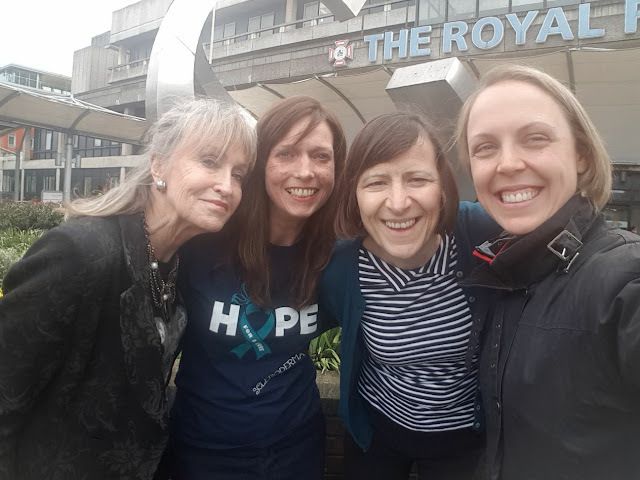 I will be celebrating my 20th year of being a patient at the world expert Scleroderma Unit, The Royal Free Hospital, next month, at the annual Family Day, Saturday 19th May 2018. This is held within the atrium at the hospital and is free for anyone with an interest in scleroderma and / or Raynaud’s, to attend. 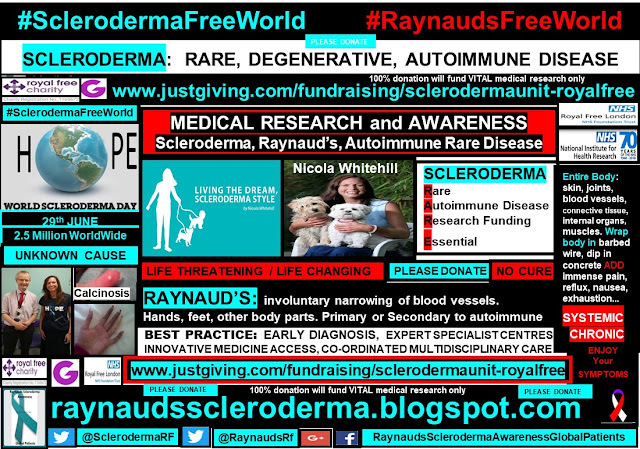 I have written extensively over the course of the last 2 years with my Column here at Scleroderma News, as to how crucial an expert specialist centre and multi disciplinary medical ‘dream team’ are, for best practice and management of this autoimmune, rare disease. When I was given those three life changing words ‘You have scleroderma’, back in the autumn of 1997, aged 24, I was also told that I was looking at, ‘a 15month prognosis, at best’. At that time, both of my parents were very supportive in attending the never ending medical appointments, which followed. In December 1998, I dragged my tin man body to the Scleroderma Unit at The Royal Free Hospital. Extensive tests followed to ascertain the severity of the disease progression. During the course of these tests, my parents would kindly accompany me, and at that time, I would have never have believed, that 20 years later, I would still be attending the Unit, having now, survived them both, and, my 'skin cured from scleroderma'. My recent clinic appointment was the first time that I have been to the Unit, in my ‘orphan’ capacity. Thankfully, thoughts of my reality were suppressed by the very welcome company of Lauren and Christine from the National Institute for Health Research, for the duration. This was in ideal opportunity for me to discuss my new role as Patient Research Ambassador for the Royal Free Hospital dermatology and MSK departments. As well as, Lauren and Christine, are better looking accompanies than my parents haha! I also had the pleasure to meet with fellow patient Jeanie, ‘Miss Universe’ who I have ‘known’, via Facebook, for a while! Here is a photo of us all.. Living the dream.. I am very much looking forward to developing my new role, especially given that an investment in medical research is crucial to improving the scleroderma, Raynaud’s, autoimmune Rare Disease patient experience. In the meantime, awareness as to our daily plight and health challenges, provides a perfect spotlight for the multitude of our clinical unmet needs. Huge thanks go to ALL of the global patients, video, who kindly took part in my Autoimmune Disease Awareness Month, #ADAM patient profiles campaign.